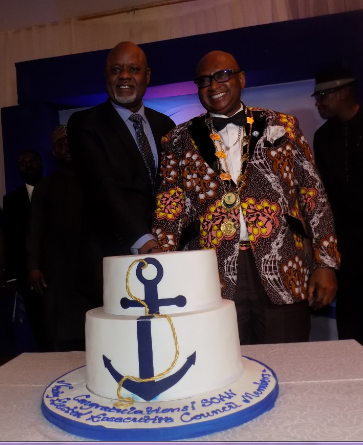 The Ship Owners Association of Nigeria (SOAN), an association founded in 2015 comprising of ship owning companies with proven track records of active participation in the maritime industry, Friday night, inaugurated its newly elected Executive Council members. 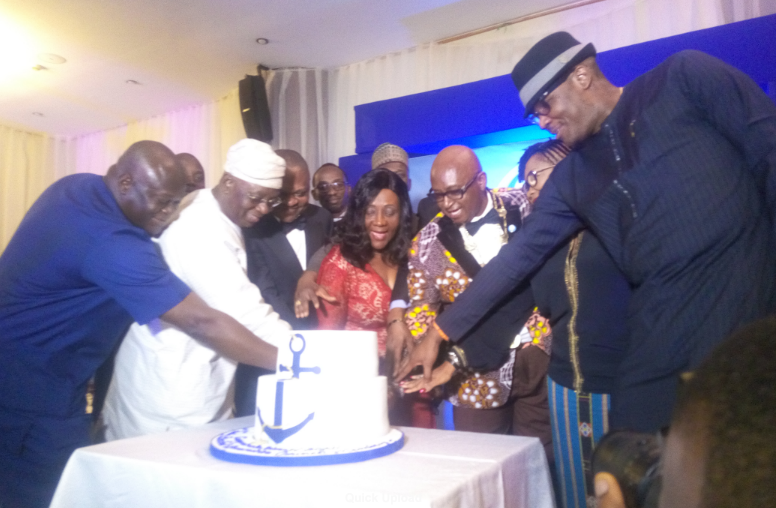 The event which held yesterday at the prestigious Oriental Hotel, Victoria Island Lagos, witnessed a change of leadership baton from former President and Nigeria’s foremost shipping mogul, Engr. Greg Utonwen Ogbeifun led executives to the newly elected executive council, led by medical doctor, Mkgeorge Onyung. It was genuinely a night to remember, where a group of Nigerians who truly and patriotically champion the nation’s interest in both the upstream and downstream sectors of the oil and gas sub sector together again, for a common vision. Recall that the association last month elected the new executive members, to run the association for the next two years. 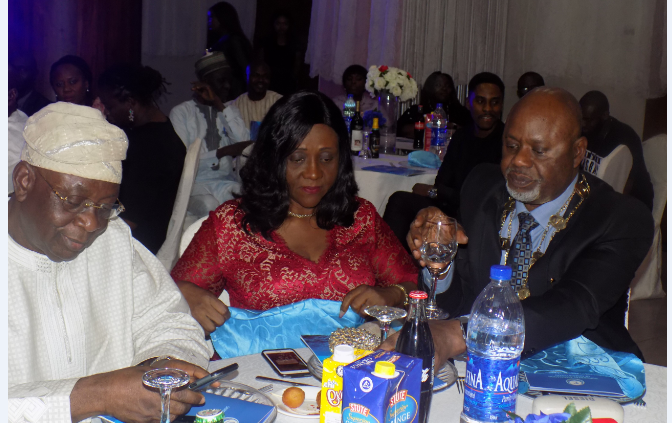 Speaking at the event, the Chairman of the occasion and former Managing Director of Nigeria Ports Authority (NPA), Chief Adebayo Sarumi said he was happy, that the association has proven to be dynamic and steadfast, against all odds. 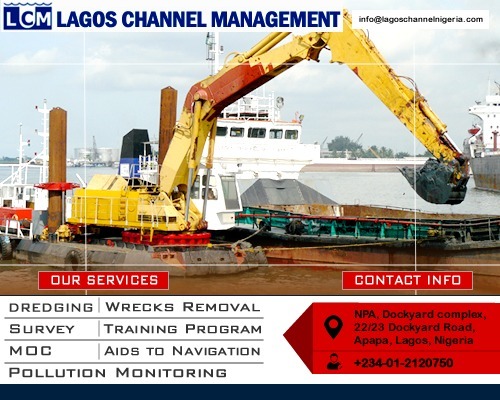 “I never thought that there are Nigerians who can actually make things happened in the shipping industry like the outgoing President and his executives. “This is the first time we will have ship Owners in the real sense of the word, here. 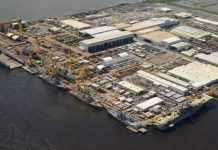 “And am happy we are getting it right, because, left for foreign ship owners, they will not want us to have an association like this, just because they want to monopolize the Industry. “I knew where we were five years ago, and I know where we are today, so I know very soon when African Ships owners are emerging, Nigeria will lead Africa and SOAN is going to be the forerunner. “I am happy that the election is without rancour and that is because all of you supported each other”, the Ibadan High Chief highlighted, urging the newly inaugurated team to work hand in hand to achieve greater result. “Remember it is not only the IOC’s that are expecting you to perform; please remember that the rest of Nigerians want to carry their cargo in Nigerian ships” he encouraged them. 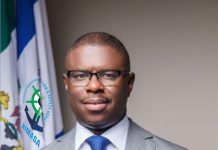 Speaking earlier, the outgoing President, Greg Ogbeifun said the ship owners association has proven to be the bed rock of the maritime industry. “The Maritime industry and shipping industry will amount to nothing without ships, so the ship owners is of utmost importance’. “I appreciate the ship owners for their support; they have made SOAN to have international recognition. “I am very proud for the support you gave to me as the outgoing president; without you, there won’t be SOAN! Cutting of the inaugural cake by the newly elected executives, assisted by the Chairman of the occasion, Chief Adebayo Sarumi (2nd left) and Barr. Margaret Orakwusi (4th left). In his goodwill message, the Rector of Maritime Academy Oron, Commodore Emma Effedua commended the association for remaining robust, despite the challenges they are facing. “As the rector of the academy there is no way we can operates without the association. 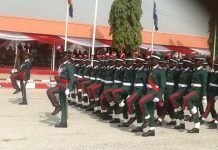 “Ogbeifun and his past executives have been so kind to us despite the challenges they are facing, supporting the school, the cadets and this we hold in high esteem. “So on this note I will want the new executives to come for facility tour of the Academy to see what we are doing and how they can encourage us to do more”, he said. Members of the new Executive Council includes Dr. MkGeorge Onyung (President), Eno Williams, Sony Eja, Babalola Adefarati, Iroghama Obuoforibo, Wisdom Nwagwu, Rotarian Lucky Akhiwu, Dr. Luis Ekere, and Gbolahan Shaba. 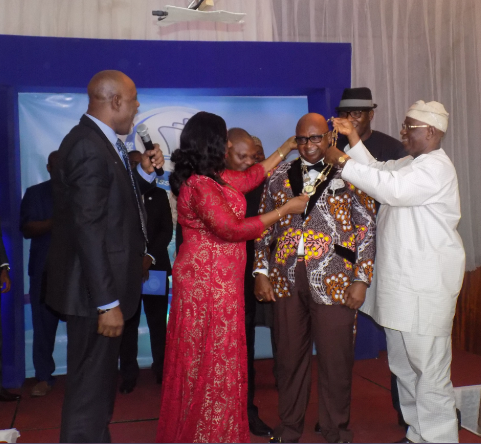 The inauguration was graced by the creme de la creme in the Maritime industry.